Celebrating the launch with Minister Ring and local political representatives are Alan Hogan, Heat Merchants Group CEO and Aiden John Derrig, Branch Manager Castlebar. The Minister for Rural and Community Development, Mr Michael Ring TD, officially opened the new branch of Heat Merchants in Castlebar, Co Mayo on Friday last. The opening is part of a €4 million investment programme by the Heat Merchants Group that will see the opening of nine new Heat Merchants branches and four additional Tubs & Tiles showrooms throughout the country over the next three years. The new Heat Merchants branch located in a 4,400 sq. ft. premises at the Castlebar Retail Park will supply a comprehensive portfolio of heating, plumbing and renewable energy solutions for both domestic and commercial projects. A range of technical services including heating system design and specification, commissioning, ancillary certification, after-sale service and installer training will also be available at the branch, which is managed by Mr John Derrig. Heat Merchants Group is an Irish-owned company trading as Heat Merchants and Tubs & Tiles. The group has 32 Heat Merchants branches and 12 Tubs & Tiles showrooms supported by a central warehouse and distribution hub based in Athlone. The Group’s business support services and technical design hub is based in offices in Athlone and Balbriggan, Co Dublin. As part of its expansion plan announced earlier this year, Heat Merchants Group is also increasing its central distribution and business support centre in Athlone with the addition of an extra 20,000 square feet of warehousing, which will extend its capacity to service its expanded branch network, including the new Castlebar branch. Welcoming the new Heat Merchants branch Minister Ring said it was a vote of confidence in the town of Castlebar and the local economy. He added: "This investment by Heat Merchants, as an Irish owned company, in Castlebar and other towns up and down the country, is to be welcomed. This kind of investment is vital, not only to create local jobs, but also to bring quality services to the area and stimulate the local economy." 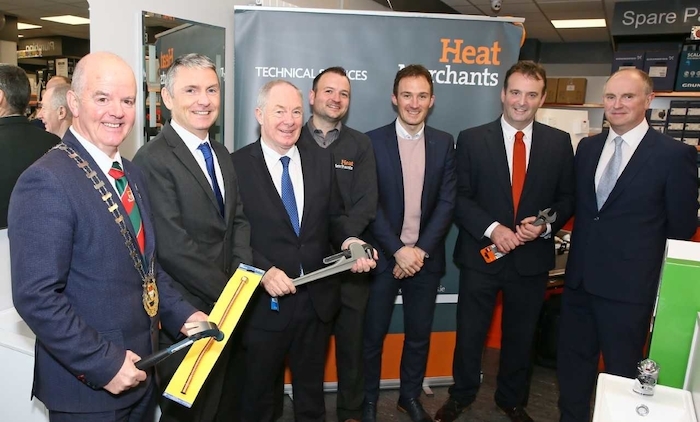 Alan Hogan, Heat Merchants Group Managing Director, said the Castlebar opening was another important milestone in the expansion of the group and its commitment to supporting the economy of towns throughout the country. He added: "As the largest supplier of heating, plumbing and home improvement materials to the professional and retail markets in Ireland, Heat Merchants Group is committed to providing innovative support services to customers and driving highest standards in the heating, plumbing and renewable sectors. We look forward to providing that quality service from this new store in Castlebar. "This opening is part of the group’s growth strategy that is focused on providing an excellent service to our customers in both construction and retail through branches that are situated in locations offering convenience and expert advice and service to our customers and reducing their travel times to pick up vital products or spare parts wherever they are working.